Valley Transit is looking to improve the bus experience for riders with disabilities. They unveiled a new automatic system that allows riders to secure themselves in less than 30 seconds with the push of a button and no help from the driver. "For me, it's freedom,” says District 4 Alderman Joe Martin. “It's freedom to come and go as I please. And the nice thing about rear-facing is I can carry a conversation on with people that are on the bus." Plans are to have a second bus equipped with the system by March and ten buses by Labor Day. 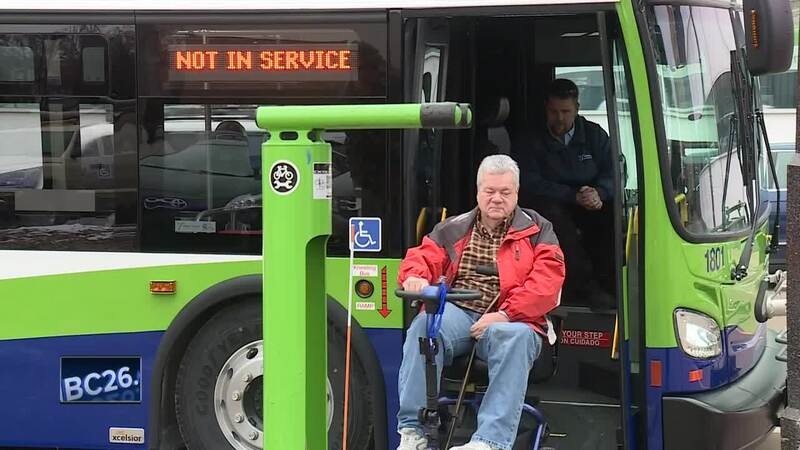 APPLETON, Wis. — Valley Transit is looking to improve the bus experience for riders with disabilities. They unveiled a new automatic system that allows riders to secure themselves in less than 30 seconds with the push of a button and no help from the driver. "For me, it's freedom,” says District 4 Alderman Joe Martin. “It's freedom to come and go as I please. And the nice thing about rear-facing is I can carry a conversation on with people that are on the bus." Plans are to have a second bus equipped with the system by March and ten buses by Labor Day.